Enjoy this beautiful log home located near Tofte, MN on your next North Shore vacation. Phoenix Cabin is a beautiful northwoods cabin located near Tofte, MN. This inland cabin has 3 bedrooms, 2 bathrooms, and a loft space, making it large enough for 8 guests. Enjoy the large back deck and views of Lake Superior. While not on Lake Superior, you can still enjoy peek-a-boo views of the lake most months. The handy entry room allows you to take off your shoes and coats. Phoenix Cabin has a beautifully appointed, open concept living area with floor to ceiling windows. The windows allow tons of natural light, while giving you peek-a-boo views of Lake Superior. Watch a movie, prepare a meal, play the piano, or just hang out with friends or family. The living room is spacious and open with traditional log cabin decor. Enjoy the ceiling-high stone surround gas fireplace- perfect for cold winter nights. The living space is open to the loft area above. The beautiful kitchen features granite counter tops and full size appliances. The kitchen has a dishwasher so you won`t have to waste precious vacation time doing dishes. The open living space in this cabin means you won`t miss a thing when preparing meals. Seating for 4-5 at the dining room table, also a great place for a board game. The master bedroom, located on the upper level, has a king bed. Lots of space in the master bedroom. The guest bedroom on the main floor has a queen bed. The third bedroom has a twin over double bunk bed and a laundry area, great for extended stays. The loft receives an abundance of natural light from the living area windows. The futon in the loft space provides the fourth sleeping area. The upper level bathroom has a shower and tub. The main level bathroom, almost identical to the upper level, also has a shower and tub. The deck has sitting and eating areas, as well as peek-a-boo views of Lake Superior. Grab a seat and share stories of your day on Minnesota`s Northshore. Have your meal outside on a warm summer afternoon. 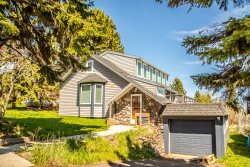 Phoenix is a beautiful log cabin home that boasts great views of the Superior National Forest, as well as being in a central location. Wildflowers abound during the warmer months Come pick a bouquet to adorn the dining room table during your stay. Even in the winter, Phoenix Cabin is a favored destination because of its convenient location to snowmobile and cross-country ski trails. When you come to the North Shore of Lake Superior, you have the right to expect plenty of space for the vacation of your dreams. The vaulted interior and floor-to-ceiling windows of this log-sided cabin help transform dreams into reality. At Phoenix Cabin, it’s all about embracing the wilderness setting. A large deck puts the North Woods at your fingertips. An enchanting stone fireplace is the perfect gathering spot for sharing stories of bears, moose and lake trout. There are three cozy bedrooms nestled into the home, with an additional futon located in the spacious loft. With Lake Superior visible from the property, the cool winds blowing of the largest freshwater body of water in the world make visions of being stuck in traffic fade into the unknown. The Phoenix is so immaculate it will be hard to leave, which works well considering the full sized kitchen equipped with everything you’ll need for preparing an epic feast. Speaking of food, the exquisite Coho Café and Bluefin Grille are right down the road. Both venues are considered among the finest dining options on the entire North Shore. Phoenix Cabin is a perfect setting year round, with dozens of trailheads located within just miles of the cabin. During the summer and fall, hiking along the nearby Temperance River or to Carlton Peak are two options that simply can’t be missed. In winter, Minnesota’s grandest ski resort, Lusten Mountains, is just up the road, as are an impressive collection of cross-country ski trails. Indeed, when you come to the North Shore you have the right for certain expectations. Allergy Warning: Guests with pet allergies should be aware that while this home is NOT a pet-friendly rental the owner has a pet and there may be some hair/dander present. The home was absolutely perfect. We had everything we could possibly have asked for unless you have a way to make the mosquitos disappear. lol We loved the location in the woods but had a view of the lake. This is the second time we have rented the Phoenix, and in both visits we couldn't ask for anything more. The Phoenix is perfection. There isn't a single thing we could want, or ask for as it is furnished with everything one would need. Beautiful home with fireplace and all the necessities including fondu pot as any respectable ski chalet needs. We loved everything! Honestly, I don't think you need to change a thing! We chose this location to have a beautiful place to celebrate my 36th birthday and to recharge our spiritual batteries before the long winter. The Pheonix was the perfect location to achieve both of those objectives. The home was wonderful and had everything we needed for our stay. Very nice secluded area near the places we wanted to visit. We liked that it felt like a cabin but still had a modern feel to it. Very warm feeling. Sad it wasn't on a lake, but that was our choice. Liked the gas fireplace a lot. Really wasn't anything we liked the least. The Phoenix was a beautiful property. It was roomy , yet comfortable. The property was secluded. If it was on the water, it would be absolutely perfect! Even without being on the water, it was close to perfect. Absolutely beautiful cabin, the Pheonix. Perfect size for the whole family. From the loft to the firepit it had everything we needed, other than groceries. We have loved the North Shore since our first visit 25 yrs ago and have made arrangements through Cascade with equal regards to ya'll. Definitely have another place to look again when we come back.